I looked over your Paste Email Plus program and I am going to purchase it this weekend when I receive my new computer. Yes, Paste Email Plus will insert custom timestamps into any text fields including Gmail messages. BTW, you do not have to "buy" Paste Email Plus (or any of my extensions) as they are free to everyone. I do, however, appreciate donations. Thanks, since you programmed it, it is the least I can do. I use this function many times everyday. Mainly in Outlook with another program, but also in GMail and Remember The Milk. I look forward to trying it shortly. Am I able to right click and insert the current Date / Time? If so, I don't understand how to make it work. There is an add on - https://addons.mozilla.org/en-US/firefo ... timestamp/ - that worked in FF3, but he is not upgrading it for FF4. Does your program have this functionality? 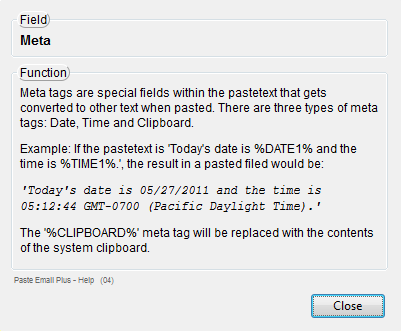 There are over a dozen different pre-define meta tags in PEP for Date/Time. They can be seen in Paste Email Plus Options > Pastetext > Add item. Thank you. I am not a programmer, but this is very interesting and I am going to give it shot after the coffee kicks in. Thanks again, I found it. If in later revisions you want to add a new date and time format here is a suggestion Day Month Year ( 27 Sep 11) and military time w/o seconds - 1223. Your program will help a lot. What program do you use for Outlook?